There’s a strong belief that treating varicose veins is more a vanity project than a health issue. Consultant Vascular Surgeon Prof Mark S Whiteley explains how varicose veins can lead to more painful conditions such as leg ulcers and should be taken seriously. And why stripping is rarely the right way forward. One of the major problems that we have in modern day medicine is a history of ignoring varicose veins and other venous conditions of the legs. For generations, doctors and nurses have told us that “varicose veins are just cosmetic”. However our understanding of the circulation and in particular the veins of the legs took a major step forwards in the 1980s with the development of a new sort of medical scanner called the duplex ultrasound. For the first time ever, we were able to see how blood flows in veins. More importantly, we were able to see the effect of the valves, clots and other things that can go wrong in the venous system. This has revolutionised our understanding of varicose veins and venous conditions of the legs. As the technology has improved and our understanding has deepened, previously held beliefs have been blown out of the water to the benefit of patients. Approximately 15 to 20% of people have visible varicose veins. However, another 15 to 20% of people have a deeper problem called venous reflux without any visible varicose veins. It’s a condition that back in 2010 I christened “hidden varicose veins”. Varicose veins are responsible for further unpleasant and often painful conditions. They can cause red and brown stains around the ankles as well as phlebitis, which is a painful inflammation of the veins. Untreated, varicose veins can lead to painful leg ulcers. How can we be proactive about leg health? Veins in the legs only work well when the legs exercise such as walking. Walking is the ideal exercise of veins as it coordinates the vein pumps in the feet, calves and thighs to push blood back to the heart. For anyone unable to walk, elevating the legs helps the blood to flow back to the heart by gravity alone, to an extent mimicking the vein pump. The higher the legs, the better the blood returns the heart through the veins. 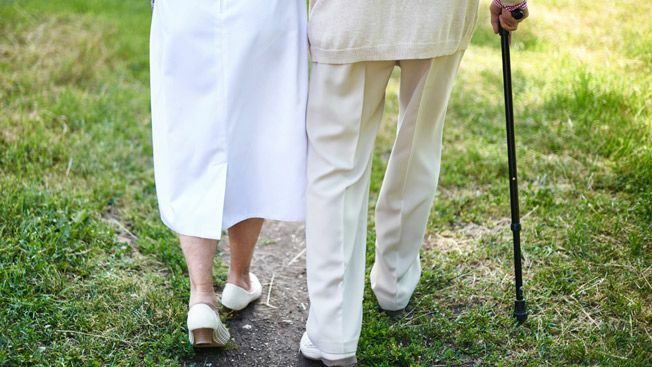 For those who have problems walking, properly fitted graduated compression stockings will also help blood return to the heart through the veins. Normally, blood flows back to the heart in the veins when it is pumped by movement. Veins in the legs have one-way valves that allow the blood to be pumped up to the heart but stop it falling back down when the movement stops. If these valves fail, blood falls the wrong way down the veins on standing, which can cause varicose veins, swollen ankles, skin damage, phlebitis, bleeding or leg ulcers. Venous (vein) disease is primarily caused by failure of these valves. It’s usually a genetic problem that runs in families and nothing can be done to prevent it. Less common is venous statis. This is venous disease found in people who have normal valves but can’t move as much as is needed, due to illness, disability, frailty or problems with bones and joints. In these cases, it is the pumping mechanism that fails, and so the blood is not pushed out of the lower legs. Even less commonly, venous disease can be caused by a problem called post-thrombotic syndrome (PTS). In patients with this, previous deep vein thrombosis (DVT) or narrowing of the veins by outside pressure mean it is hard to pump the blood out of the leg against a blockage or a resistance. Temporary relief from the conditions caused by valve failure can be achieved with elevating the legs, bandaging, stockings and painkillers. However, they can only really be cured when venous duplex ultrasound scan has shown which veins are affected and the veins are treated with new techniques such as endovenous laser or foam sclerotherapy. For those who are suffering from venous statis, where the problem is caused by immobility, the best treatment is elevating the legs, compression stockings or bandages, or even using mechanical or electrical pumps to stimulate the muscles in the feet and calves. However no one should be assumed to have venous stasis unless they have had a venous duplex ultrasound scan to check whether the valves are working or not. PTS can now be treated by opening the veins using a metal tube called a “stent”. However once again, it is essential to have a venous duplex ultrasound scan to find out what the condition is before any treatment is considered. The only cure for these conditions is a proper diagnosis with venous duplex ultrasonography followed by appropriate endovenous “keyhole” techniques. When is it time to talk to a specialist? Since July 2013, the National Institute of Health and Clinical Excellence (NICE) has produced guidelines as to who should be referred to a vascular service for venous duplex ultrasound and treatment (NICE CG 168). If the person can’t get to a surgery, then a visiting GP or District Nurse can make the referral is to a vascular service as a scan is essential. Transport will be needed to get to the appointment. What is the vascular service? A “vascular service” is defined as a team of healthcare experts who can perform duplex ultrasound and can perform all of the endovenous techniques needed to treat vein problems. Patients should not accept referral to, or advice from, doctors who do their own scans and then decide what they can offer, or any suggestion of stripping of the veins. What help does the NHS offer? Despite approximately 30% of the population having varicose veins or “hidden varicose veins” and some 500,000 people in the UK having leg ulcers, venous disease has never been regarded as particularly important or a priority by English doctors or nurses. The result of this is that true venous specialists are few and far between in the UK. Most vascular services that look after veins are run by vascular surgeons whose major interest is arterial surgery. This means aortic aneurysms, carotid surgery and leg bypass grafts. Although very skilled in arterial surgery, a great many do not regard vein problems as important and therefore many excellent hospitals offer very poor services for venous patients. Is private provision a better option? Because of the lack of specialists in the NHS there has been a rise in private providers for vein services. Unfortunately, the separation between NHS and private providers is not a guarantee of quality in venous surgery. In both NHS and private practice, a great many clinics think of veins as only cosmetic, and offer a consultant doing their own scans without having a multidisciplinary team and are often unable to offer a full range of venous services. As such, these do not fulfil the criteria of a “vascular service” as defined by NICE CG 168. What steps should patient and family take? It has become essential for patients and their relatives to do their own background research to find out where they want to be referred. They need to be certain that any referral is made to a team where vascular technologists or other specialists in venous scanning perform duplex ultrasound scans and consultants see and assess patients. In addition, for the best results the team referred to should have a good background in venous disease and should be able to show an active research programme. Whether NHS or private, a patient with any of the venous problems outlined above should have a venous duplex ultrasound scan performed by a specialist who does nothing but venous duplex ultrasonography. These experts are usually called vascular technologists although some others come from different backgrounds. To get to the standards required, such specialists will only perform duplex ultrasound scanning and hence will be part of the team. The patient also needs to see a specialist in venous treatments, usually a surgeon but sometimes an interventional radiologist, who should then assess the patient along with the venous duplex ultrasound scan. Although the guidelines then say that stripping is acceptable if neither of the two above are suitable, in the last 15 years of experience we have not found a single patient who has ever needed stripping. Stripping is usually now offered only by doctors who are unable to perform the endovenous treatments above and, as such, should not be offering a venous service. Anyone with varicose veins, swollen ankles, red or brown stains around the ankles, phlebitis, bleeding from a leg vein or leg ulcers need to be seen by venous specialist. Patients should press for a venous duplex ultrasound scan and an appointment with a specialist to find out exactly what is going on inside the veins. Most of these conditions can now be cured with local anaesthetic treatments that do not include vein stripping. Vascular Surgeon Professor Mark Whiteley MS FRCS(Gen) FCPhleb is a visiting Professor at the University of Surrey and is a founder of the Leg Ulcer Charity. For more information about veins and treatments visit the The Whiteley Clinic web site. To make sure you hear about the latest articles on our site and receive free access to our guides why not sign up for our newsletter? Simply click on the box below to join the family.